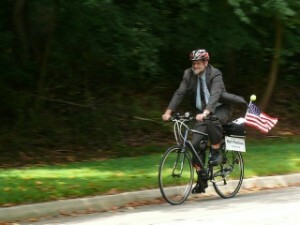 Mark rides his bike to a Mayor and Council meeting. Mark served two terms as Rockville Councilmember from 2009 to 2013. He came to the elected body with a long history of neighborhood service. In his two terms on City Council, he reduced spending while growing Rockville’s tax base. Mark led the effort to lease Red Gate Golf Course, greatly reducing its taxpayer subsidies. He is the candidate who voted to fund the new Police Station and the Senior Center Expansion, and to bring Choice Hotels International headquarters to Rockville. He initiated the Rockville Summit that brought together residents, businesses, non-profits, education, and government to discuss Rockville’s future. His experiences as a small business owner, president of the College Gardens Civic Association, and chair of the Town Center Action team (TCAT) give him a unique perspective on the needs of businesses and residents. While off the council Mark walked the entire City from 2014 to 2015 including all streets, parks, and public school campuses. You can read about it here. Mark has great facility in working with Rockville’s budget. He constantly looks to the future and is very good at identifying and planning for challenges over the horizon. He led the Finance and Budget Task Force in his first term. This group made numerous suggestions for improving the budget-making process, revising the City’s Financial Management Policies, and improving the budget books. In his second term, he convened a few members of this team that wrote a proposal for revising the City’s debt limit guidelines; this proposal was adopted unanimously. Mark was a member of Rockville’s Retirement Board where he has worked relentlessly to reestablish the health of this fund after the Great Recession. He is also the Mayor and Council’s Board Representative for Rockville Economic Development Incorporated (REDI) where he works to expand the City’s tax base. See a fuller list of Mark’s Council accomplishments from 2009 to 2013. Mark resides in College Gardens where he was a College Gardens Civic Association block captain for 4 years, secretary for 2 years, and president for 4 years. As president of the CGCA, Mark led the neighborhood in its dealings with City Staff that resulted in the award-winning College Gardens Park. Over 40 people from the neighborhood participated in its redesign. Mark worked to end distrust between the neighborhood and City Staff and to come up with alternatives that resulted in a Stormwater Management Facility being placed in the park and with a much improved park. The new park has won 7 awards including a national award from the American Public Works Association. Mark effectively represented College Garden’s interests when the zoning ordinance was rewritten. He attended Planning Commission and Mayor and Council meetings on the topic, presenting several times and making numerous comments and suggestions. He constantly communicated with the neighborhood on the new zoning ordinance through newsletters and emails. Mark has a Master’s Degree in Mathematical Statistics and a Bachelor’s Degree in Mathematics. He worked as a Senior Statistician with the US Department of Agriculture and then at Westat as a Senior Systems Analyst. He was a Senior Fellow at Mathematica Policy Research, Inc. In January 2010 he started his own company MMP Survey Services, LLC; a successful endeavor from the start. Through that company, Mark is a member of the Rockville Chamber of Commerce. Mark was a Peace Corps volunteer from 1980 to 1983 in Swaziland in Southern Africa. He taught high school Mathematics and Biology on a Roman Catholic mission. There he met his British wife Lesley Cross, his staunch ally. His two daughters attended Montgomery County Public Schools from kindergarten through high school and are now young adults.